Well Peter, here you go. I hope this helps! DBCC CLONEDATABASE was made available in SQL Server 2016 SP1, so that’s what we will use for testing as it’s the current release, and because I can use Query Store to capture my data. To make life easier, I’m creating a database for testing, rather than restoring a sample from Microsoft. Take note: I used the cool new CREATE OR ALTER PROCEDURE syntax which is available in SP1. We will run our stored procedure a couple times to get some data in Query Store. I’ve added WITH RECOMPILE because I know that these two input values will generate different plans, and I want to make sure to capture them both. If we look in Query Store, we see the one query from our stored procedure, and two different plans (each with its own plan_id). If this were a production environment, we’d have significantly more data in terms of runtime statistics (duration, IO, CPU information) and more executions. Even though our demo has less data, the theory is the same. The newly generated database generated from DBCC CLONEDATABASE isn't supported to be used as a production database and is primarily intended for troubleshooting and diagnostic purposes. In order to make any changes for testing, I need to take the database out of a read-only mode. And I’m ok with that because I do not plan to use this for production purposes. If this cloned database is in a production environment, I recommend you back it up and restore it on a dev or test server and do your testing there. I do not recommend testing in production, nor do I recommend testing against the production instance (even with a different database). 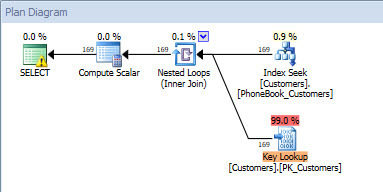 In checking Query Store, you’ll see the same plan_id value as before. There are multiple rows for the query_id/plan_id combination because of the different intervals of time across which the data was captured (determined by the INTERVAL_LENGTH_MINUTES setting, which we set to 5). For our first test, let’s look at how we could test a change to our code – specifically, we'll modify our stored procedure to remove the [Active] column from the SELECT list. If you happened to display the actual execution plan, you'll notice that both queries now use the same plan, as the query is covered by the nonclustered index we created originally. You'll also notice here that there is a new query_id (40). Query Store performs textual matching, and we changed the text of the query, thus a new query_id is generated. Also note that the object_id stayed the same, because use used the CREATE OR ALTER syntax. Let's make another change, but use DROP and then CREATE OR ALTER. Now the output from Query Store gets more interesting, and note that my Query Store predicate has changed to WHERE [qsq]. [object_id] <> 0. The object_id has changed to 661577395, and I have a new query_id (42) because the query text changed, and a new plan_id (43). While this plan is a still an index seek of my nonclustered index, it's still a different plan in Query Store. Understand that the recommended method for changing objects when you’re using Query Store is to use ALTER rather than a DROP and CREATE pattern. This is true in production, and for testing such as this, as you want to keep the object_id the same to make finding changes easier. For Part II of our testing, rather than changing the query, we want to see if we can improve performance by changing the index. So we will change the stored procedure back to the original query, then modify the index. Because I dropped the original stored procedure, the original plan is no longer in cache. If I had made this index change first, as part of testing, remember that the query would not automatically use the new index unless I forced a recompilation. I could use sp_recompile on the object, or I could continue to use the WITH RECOMPILE option on the procedure to see I got the same plan with the two different values (remember I had two different plans initially). I don't need WITH RECOMPILE as the plan is not in cache, but I'm leaving it on for consistency's sake. If I check the plan, I can see that the modified index is being used. And now that I have a different plan, I could take it a step further and try to simulate a production workload to verify that with different input parameters, this stored procedure generates the same plan and uses the new index. There's a caveat here, though. You might have noticed the warning on the Index Seek operator – this occurs because there are no statistics on the [LastName] column. When we created the index with [Active] as an included column, the table was read to update statistics. There is no data in the table, hence the lack of statistics. This is definitely something to keep in mind with index testing. When statistics are missing, the optimizer will use heuristics which may or may not convince the optimizer to use the plan you're expecting. I’m a big fan of DBCC CLONEDATABASE. I’m an even bigger fan of Query Store. When you put the two of them together, you have great capability for quick testing of index and code changes. With this method, you’re primarily looking at execution plans to validate improvements. Because there is no data in a cloned database, you cannot capture resource use and runtime stats to either prove or disprove a perceived benefit in an execution plan. You still need to restore the database and test against a full set of data – and Query Store can still be a huge help in capturing quantitative data. However, for those cases where the plan validation is sufficient, or for those of you who don’t do any testing currently, DBCC CLONEDATABASE provides that easy button you’ve been looking for. Query Store makes the process even easier. I don’t recommend using WITH RECOMPILE when calling stored procedures (or declaring them that way – see Paul White's post). I used this option for this demo because I created a parameter-sensitive stored procedure, and I wanted to make sure the different values generated different plans and didn’t use a plan from cache. Running these tests in SQL Server 2014 SP2 with DBCC CLONEDATABASE is quite possible, but there’s obviously a different approach for capturing queries and metrics, as well as looking at performance. If you’d like to see this same testing methodology, without Query Store, leave a comment and let me know! excellent and detailed step by step post. If I had made this index change first, as part of testing, remember that the query would not automatically use the new index unless I forced a recompilation. In the code above the SP had been ALTERed, which would have forced a recompile automatically. If that had not been done, and I had just added a new index, then I would need to either force a recompile on the SP before testing, use the RECOMPILE option when running the SP, or remove existing plans in cache before testing the index. Query Store is not available in SQL Server 2014, so it cannot be used to capture metrics, you would have to capture them using an alternate methodology.